In 2012 a small piece of history was returned to its rightful place. This part of history has its own tale to tell. But first here is a little background information. In South Carolina July 16, 1888 Joe Jackson was born into poverty. Due to the lack of child labor laws then and his poverty stricken family, Joe was hired at age 6 to sweep the lint that accumulated quickly on textile mill floors. He never learned how to read or write. Jackson continued to work in the mill as he grew up. One of the favorite past times back then were baseball games between mills. Joe started out playing at a young age on his mill’s team. Later Joe was hired at the age of 13 to play on the mill’s adult men’s baseball team for these competitions. While playing one of these games his batting and throwing prowess was discovered. Mr. Jackson emerged as a great baseball player with an amazing, innate talent to play ball. His lifetime batting average of .356 still stands as third best in baseball history. Once during a mill game, Joe’s shoes were rubbing blisters on his feet. He took the shoes off and played the remainder of the game barefooted; a fan from the other team noticed his unshod feet and yelled, “You shoeless son of a gun.” Shoeless” Joe Jackson became his nickname. Oddly he only played without shoes that one time. After playing for different teams he played for the White Socks and became famous for his skills. While playing with the White Socks in the 1919 World Series he and seven other players were accused of taking bribes to throw the game. Shoeless Joe never played his beloved baseball again professionally after the trial but did coach several teams in Georgia. Later he and his wife, Kate, moved back to South Carolina where he opened a liquor store in Downtown Greenville. He later died in December of 1951. Investigations are still in progress to prove his innocence as new information is being uncovered. Well over half a century after his death many sports fans still love him. 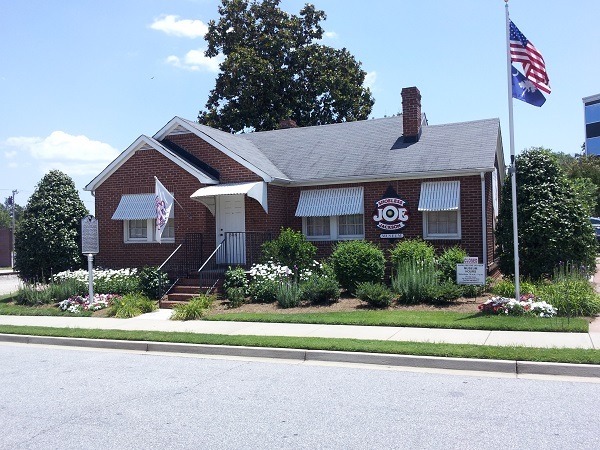 Baseball fans, old and young, from all over the world visit the Shoeless Joe Jackson Museum in Greenville, South Carolina. His fans still leave baseballs and flowers on his grave. Now for Miss Kate’s (or Katie, as I knew her) part of the story. Joe married Miss Katie when she was 15 years old and he was 20. They remained married until his death in 1951. Miss Katie ran the finances for Joe’s career. Joe loved her and respected her sharp handling of numbers and money. Miss Katie was devoted to him as well. They never had any children but enjoyed neighborhood children’s visits. Shoeless Joe and Miss Katie, as I knew her, lived beside my grandmother, Nina Youngblood in Greenville, SC on Welborn Street. Miss Katie was not only a neighbor but a friend of my grandmother’s. Their houses side by side had white picket fences around them. Both ladies loved their flowers and their homes. Miss Katie knew me as a little girl, between the ages of 1-8 when I would come with my mother and sister to visit grandmother. Back then we rode the bus everywhere because we only had one car and Daddy needed it for work. Miss Katie Loved Our Visits. Sometimes we would ride the bus to visit grandmother after I had a doctor appointment for strep throat. When I was about 4 I got a shot of penicillin in one hip and a vitamin shot in the other, which made me limp along pitifully with a hand on each injection site. Miss Katie always spoke of how cute and pitiful I looked walking like that. 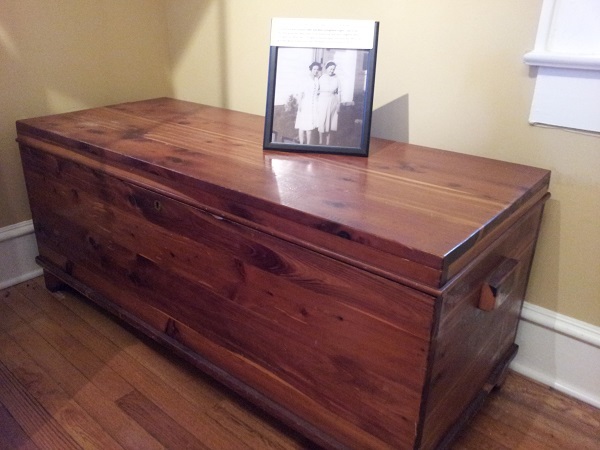 Upon her death in 1959 Miss Katie gave her cedar chest, very likely her hope chest, to Grandmother Youngblood. When Grandmother died, she left the chest to me because of Miss Katie’s fondness for me. I actually remember her too, as well as being in her kitchen and living room and the beautiful irises and roses she cherished around her yard. I enjoyed using the chest for many years and loved the beauty of its cedar finish and the wonderful cedar scent it never lost. After several moves it was stored in an outbuilding. Although frequent dry weather marred it’s beauty, I was able to renew some of the wood’s luster and moved it into my bedroom. Several years later I decided it was time to send the chest back to its home. I contacted Miss Arlene Marcley, then the curator of the Shoeless Joe Jackson Museum in Greenville, SC about donating the cedar chest to them. I had enjoyed and kept it for myself long enough. But now the time had come for it to return to where it belonged. The Jackson home-place on Welborn Street was disassembled in 2006 and relocated to 356 Field Street on a site dedicated to the Shoeless Joe Jackson Museum in downtown Greenville, South Carolina near a baseball stadium. The opening of the museum was in 2008 and it is located across from a large baseball stadium. Old furniture, donations, mementos and awards of Joe and Katie fill the house. The kitchen and living room were refurbished with furniture and donations given by friends and made to look like it did when I was a child. 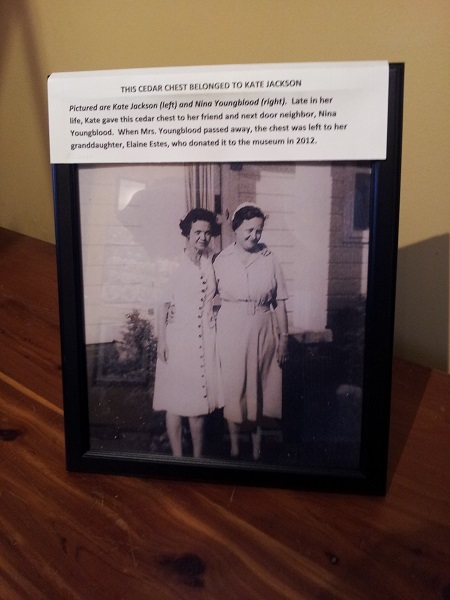 Now the museum has another piece of Miss Katie’s history to go in a room. Arlene and Bill Marcley were really excited to have the cedar chest. They had not known about it until I contacted them. Donating the chest made me a little sad but a lot happier, knowing the chest is now where it should be: a place to help people remember Shoeless Joe and Miss Katie and to celebrate an amazing athlete from history. I made some changes and added the site for the museum for those interested in learning more. Thank you M’am.I have never been a sports fan either. Glad you still enjoyed. By the way the post A Modern Psalm was the one I wrote years ago but shared because you inspired me to share it. aha. i was wondering if you gave up and just posted the guest post instead. 🙂 will be looking for it. Oh wow!! How very cool… And I’m sure it was hard to part with the chest, but you seem at peace with it. It was the right thing to do, but not everybody would have done the right thing so kudos to you! My dad’s uncle was a professional baseball player in early 20th century so I grew up hearing lots of old timers baseball stories. My dad used to tell the story about, as a young boy, going down to the Pirates clubhouse at Forbes Field with his Uncle Harry and sitting on Honus Wagner’s lap! That is very cool too!! I love family stories that join us to our family history. Delighted that you enjoyed it!! What a wonderful story and tribute! Thank you. It felt right to return the chest to where it truly belonged. Thank you, juice. It just seemed like the right thing to do. Delighted that you enjoyed the post. What a delightful story ! Thank you! Delighted that you enjoyed it!! Thank you, Clive. Your words started my morning today! What a beautiful start!! I too have never understood the obsession with sports. Lol, but I understand that athletes work very hard to be become strong players. My energies and interests lie in other directions though. I will be writing several more blogs about this grandmother soon. She grew up working in the mill after starting out on a farm. She was a real country gal. Thanks again!! I look forward to more stories, she sounds a real character! Don’t get me wrong, I love sports, but there are some I’ve never really understood! A bit like the game you guys call football, when only 2 in a team of thousands ever put a foot near the ball! Lol! Never thought about it that way! Thank you, Ksbeth. I really loved that old chest. But I knew it where it belonged. I felt I owed it to Miss Katie to have a part of her life there too. She was vital to his success as an adult. I isited the house in its new home and was so pleased that I remembered the kitchen and the living room pretty well from 60 or more years ago! LOL! Miss Katie loved children, so I remember her making cookies for us sometimes. So many memories. I knew the story of Shoeless Joe. Thanks for sharing this with us. It is a wonderful story of the journey of this chest. Anne, Thank you for commenting. I posted this in a Greenville SC page on Facebook and was so pleased that so many read it and commented on it!